I'm back with another submission for the current Moxie Fab challenge....I keep plugging away, but so far, I've never won. We'll see....at least it's fun to participate and share with other card lovers. I have to admit, I'm not a real b-i-g fan of glitter or bling (just a little bit for me please) but I decided to go out of my "element" and use some Doodlebug glitter that I won on another blog giveaway (and I had the colors to match). I also used some neat tools in my stash including a Martha Stewart border punch, a Quickutz embossing folder, my Spellbinders Labels One dies along with a tag die, along with some pretty K&Co ribbon. Supplies from Papertrey Ink include their rustic twine, Vintage Cream Ink, and the Mega Mixed Messages stamp set. The chipboard butterfly and hearts are from Fancy Pants. Thanks for spending a few minutes with me today, I hope you enjoyed it! I totally just bought that big polka dot embossing folder. 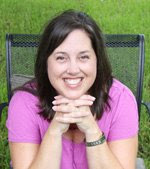 Love your layers on this one! Super cute card! 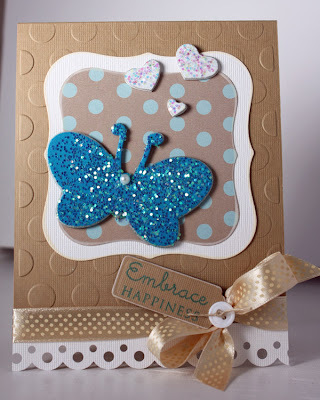 Love those embossed dots, and that glittery butterfly is awesome! 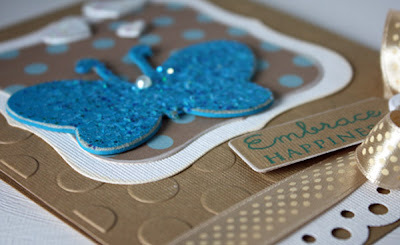 Love that big polka dot embossing folder! Very pretty! Great job on the trigger!